But following a string of disasters that seem to suggest that film critics aren't the only ones who wish the ex-Python turned fantasy director would give up and go away (floods and landslides brought his ill-fated Don Quixote project to a standstill, while leading man Heath Ledger dropped dead before this current film was completed) Terry Gilliam is back. 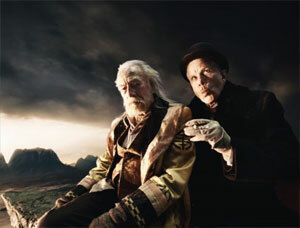 The eponymous Dr Parnassus (played with just the right mix of pathos and ham by Christopher Plummer, who seems to be everywhere these days) is a doomed, Melmoth the Wanderer/Flying Dutchman-style immortal, cursed to trudge the face of the earth for eternity after an ill-judged deal with that inveterate wily gambling addict, Mr Nick, aka Tom Waits, playing the Devil as, well Tom Waits, really (if you've seen Bram Stoker's Dracula or Domino you'll know what I mean) – a menacing, capering buffoon on the brink of insanity. Now, together with his tawdry troupe of old school sideshow performers, Parnassus trails up and down Britain in his grotty, claustrophobic caravan like some kind of reject from Harry Potter's magical work, peddling his demented flying circus at a supermarket car park near you to universal ridicule. But rotten reviews are the least of our hero's problems, for in yet another wager with Satan, he's gambled away his only daughter, Valentina (a commendable performance from model Lily Cole, in what can't have been an easy first role) and now he must win over five souls before she turns sixteen, or the Devil will take her. As if that weren't bad enough, he's also saddled with Tony (Heath Ledger), a muddled amnesiac the troupe find hanging from a bridge, who, far from being a down-to-earth everyman to bring order to their world, turns out to be far more sinister and twisted than Dr Parnassus and co. could ever be. See, the problem is, Ledger died before Gilliam could film the Imaginarium scenes, so the resourceful director hit on the idea that one's looks are transformed through the looking glass, allowing a clutch of helpful A-listers (oh, and Jude Law) to step into the breach. 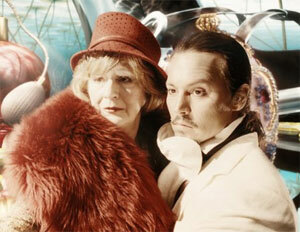 However, this only serves to prove that the film would have been much better if Johnny had played Tony throughout: with his deft, comedic touch and self-mocking charisma, he's absolutely perfect, bringing a grace and lightness and dangerous likeability to the role that evades poor Heath completely. Colin Farrell sees Tony out, but by then we've all pretty much lost the plot, if not the will to live. But bear with it, because Gilliam does pull a nicely satisfying ending out of the ragbag. Honest. There is lots in this film that is delightful, quirky, fascinating and fun. There is also much that is incoherent, badly scripted and nonsensical in all the worst ways, and should best have ended up on the cutting room floor. For a film that revolves around the power of storytelling and the importance of freeing the imagination to discover one's true self, there's rather too much mumbled confusion and cluttered, dead end plotting to let the story shine through or the mind take flight. But despite that, there's enough good stuff beyond the magic mirror to make your trip worthwhile: you won't discover the Meaning of Life, but you'll have fun looking for it.